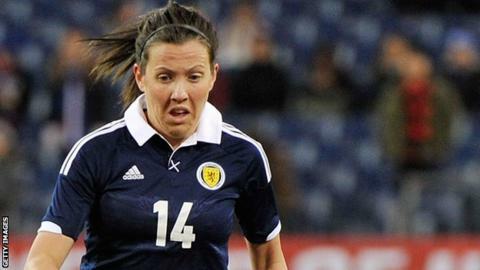 Scotland midfielder Leanne Crichton has joined Women's Super League side Notts County Ladies from Glasgow City. The 27-year-old helped City complete their third consecutive domestic treble in 2014, winning the Scottish Women's Premier League title, Scottish Cup and Premier League Cup. Crichton, who has scored three goals in 26 games for Scotland, wants to add to her trophy collection at Meadow Lane. "I think we've got to win silverware," she told the club website. "With the squad we've got here, we need to be beating what they achieved last year, anything else has to be viewed as a failure." The Lady Magpies finished sixth in their first season England's top-flight competition since relocating to Meadow Lane from Lincoln. Notts manager Rick Passmoor said Crichton would add "strength and quality" to their midfield.